Emily, Marian and me met up at Dolar Shop Hot Pot for dinner on a week day. Emily had just returned from China. Emily made reservation and she was there early to ensure we had a table. Marian picked me up from work and when we arrived, there were people waiting in the waiting area. 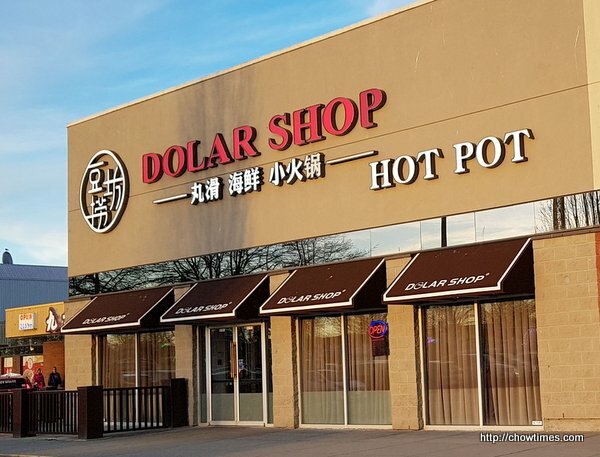 Do not be misled by the name of this place, it sounds like dollar store but it is a high end hot pot restaurant. 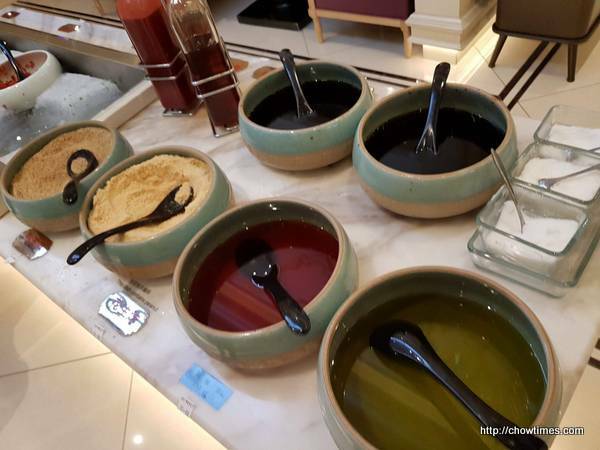 There is a sauce bar with appetizers and various sauces for you to mix and match. 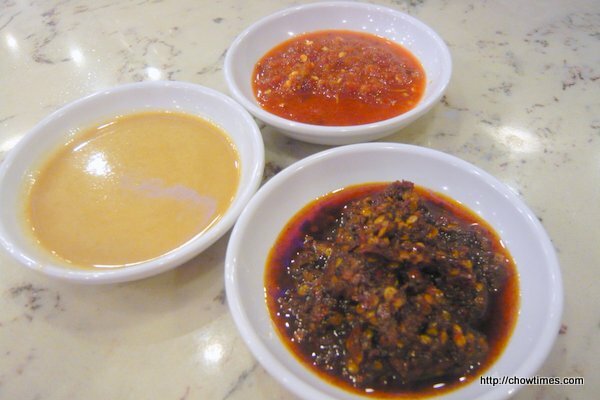 Here are some of the items on the sauce bar. Emily, Marian, Lorna and I met up as Emily and Marian will be going back to China and Philippines respectively for holiday. 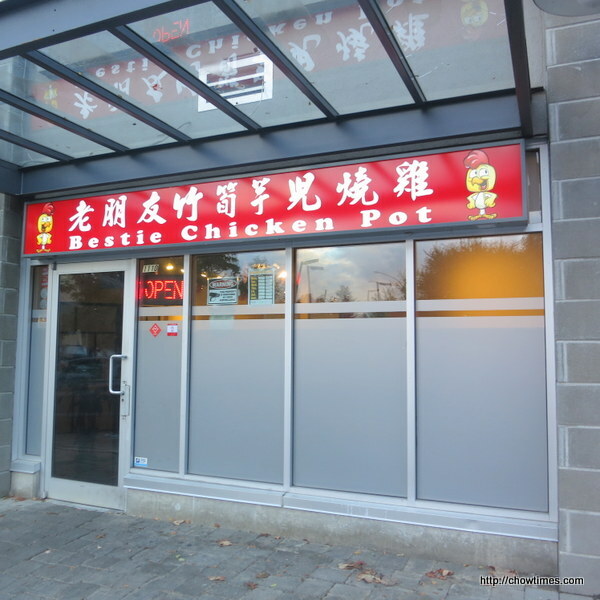 We met in Bestie Chicken Pot which is on the Chopstick Fest list which took place from Oct 15-30. We arrived at 6:00PM and the place was not busy yet. 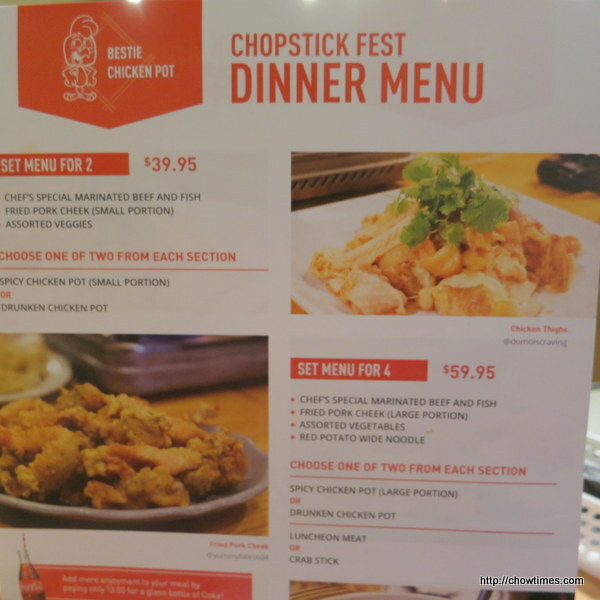 We ordered the set menu for 4 for $59.95 from the Chopstick fest menu. The server told us that the chopstick fest menu is limited per night and has to be reserved but they managed to allocate one for us. 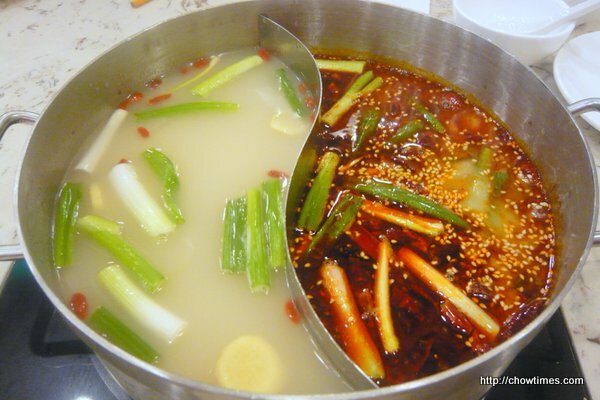 What better than hot pot in a cold winter day, with arctic chill? Ben and I went to Little Sheep Hot Pot for lunch yesterday. We were there early, around 11:30AM and the place was not busy yet. It felt a bit strange when water is served instead of Chinese tea. 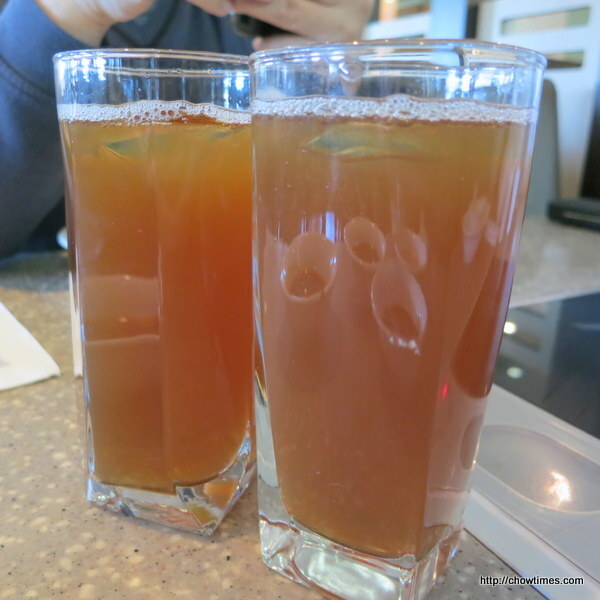 We did not care much about the water because the lunch set which we ordered came with a cold plum drink. We yearned for hot pot during the colder days. 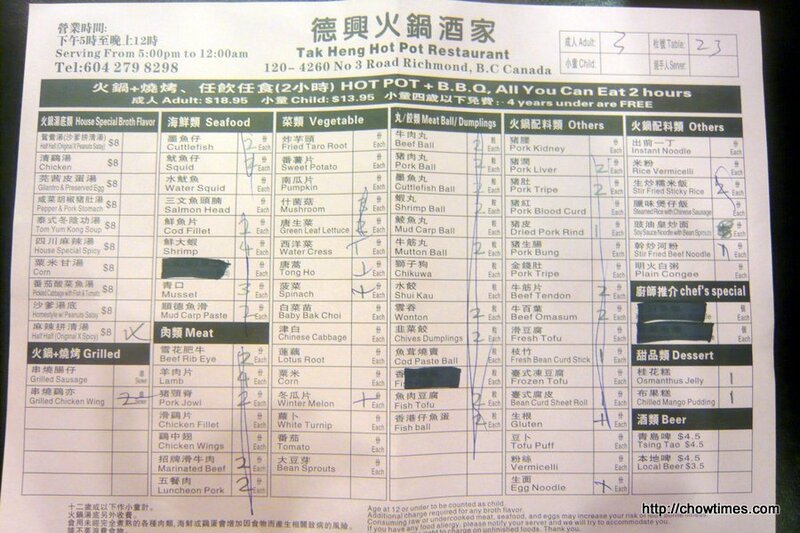 So, Ben, Nanzaro and I returned to Tak Heng Hot Pot for a hot pot dinner. Arkensen did not come along as he dislikes hot pot. 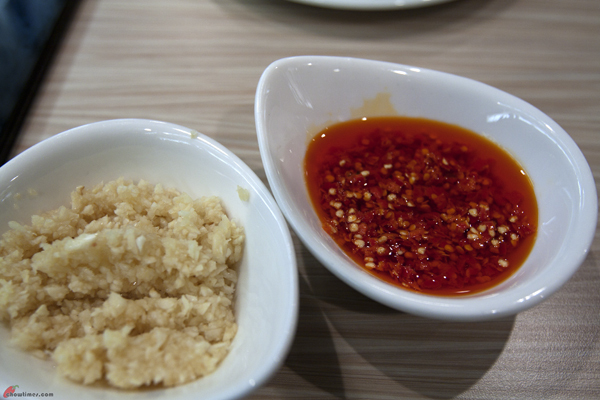 We had half half soup base (original and spicy). All soup base is $8. 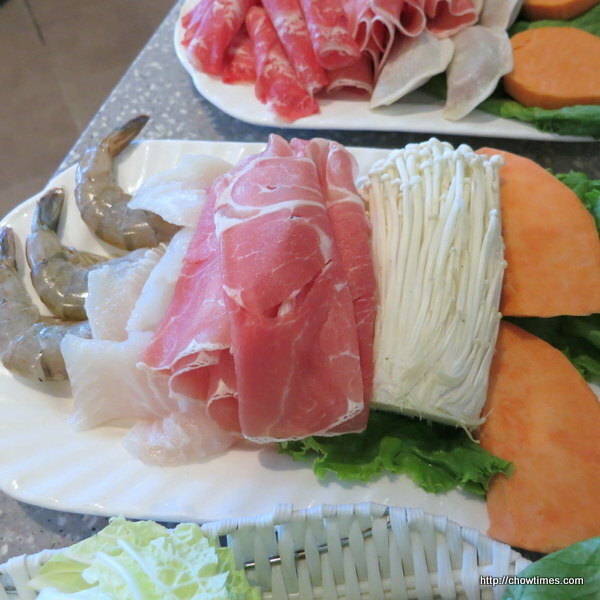 The all you can eat hot pot is $18.95 per person for adult. You can click on the menu to have a larger view. We were their first dinner customers of the day as it was just past 5PM. It’s lunch time on a Sunday. The boys wanted some comfort food and suggested to go to Yaohan Center food court. It’s been quite a while since we last visited the Yaohan Center food court. The boys went straight to the Curry House stall for their comfort food. Arkensen ordered the Hainanese Chicken Rice while Nanzaro had the Char Koay Teow. I walked around to look for something for myself. 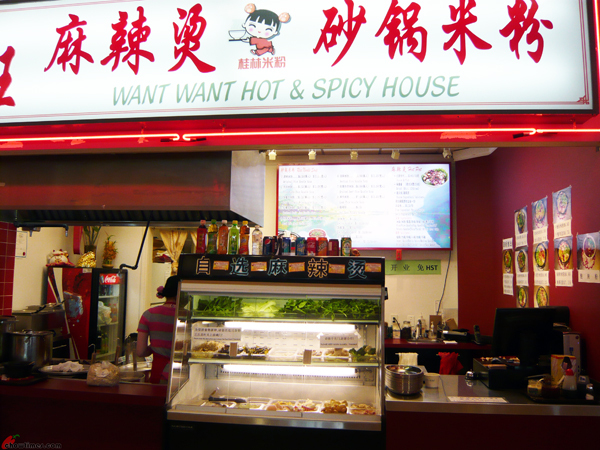 The Want Want Hot & Spicy House caught my attention. The name sounded familiar. Apparently, there is a similar name stall in Crystal Mall. Upon checking with the server, I was told that this stall had opened for business in Yaohan Center for a year. 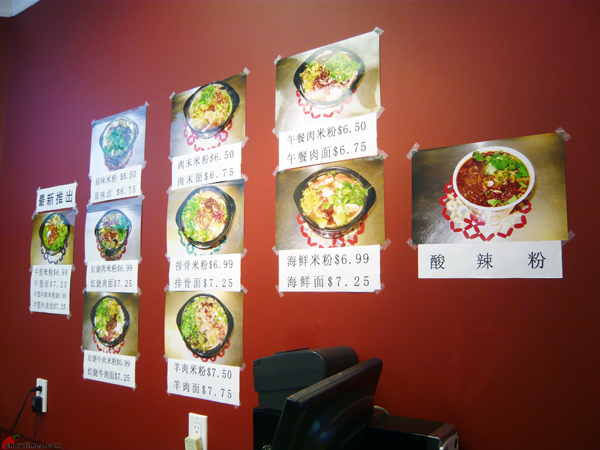 My attention was caught by the photos of noodles in hotpot on the wall, especially the red hot on the right. But, I did not order that. I ordered the Lamb Noodle instead. I love lamb. The server asked me if I want it spicy and if I want cilantro with it. Of course, my answer is yes for both. 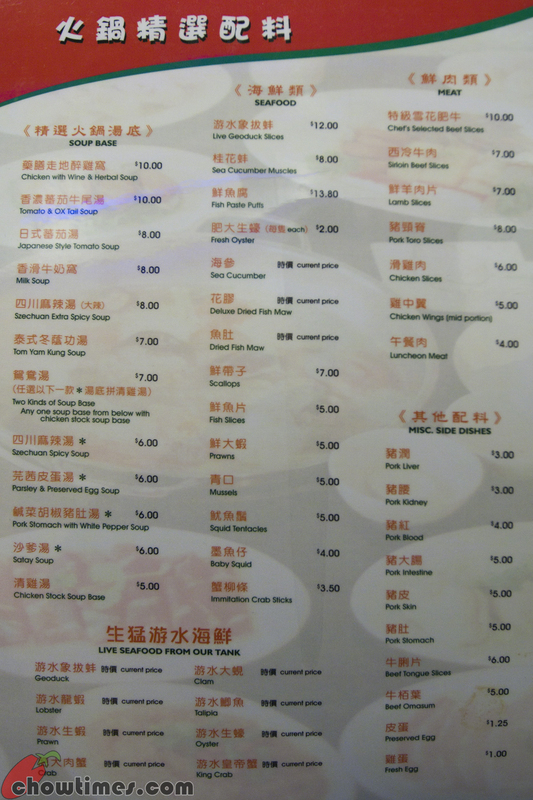 The lamb noodle is $7.75. Updated 9th Oct 2014; This restaurant is closed. We had always thought that U Good is a hot pot restaurant. That is why we had never quite had the desire to give them a second glance unless we want to go for hot pot. Yeah, they started off as a hot pot restaurant and indeed they are known to be one. The other thing that we did not take a closer look was that, this being a hot pot restaurant, their windows are often misted up. So we could not even take a look as we drive past. I don’t know when this happened but U Good had stealthily changed their name by dropping the words “Hot Pot” from their sign. I knew they were closed for a bit sometime last year. Maybe that was when it happened. 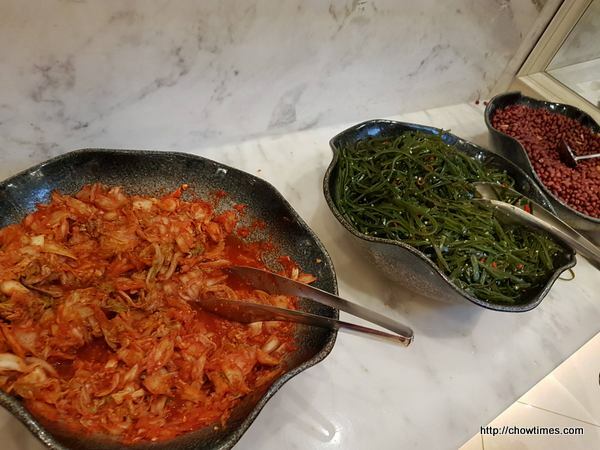 That day when we visited, Suanne and I were unsure of where we wanted to go for dinner since the boys were away again for their extra curricula activities. We thought we just go to the Union Square in Richmond and walk around to see if there is anything that will pique our interest. There are quite a few restaurants in Union Square that we have never blogged about before anyway. 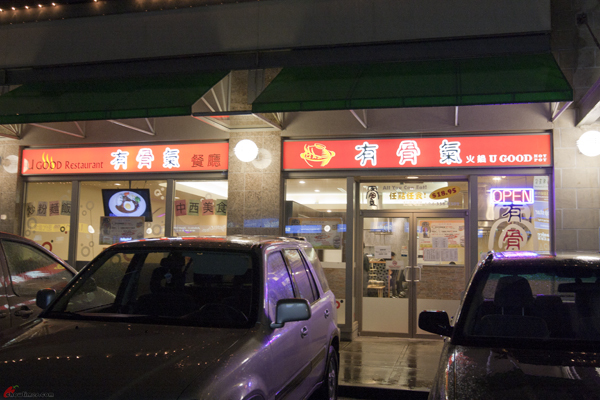 We were not interested in having hot pot but we happened to park right in front of the restaurant. 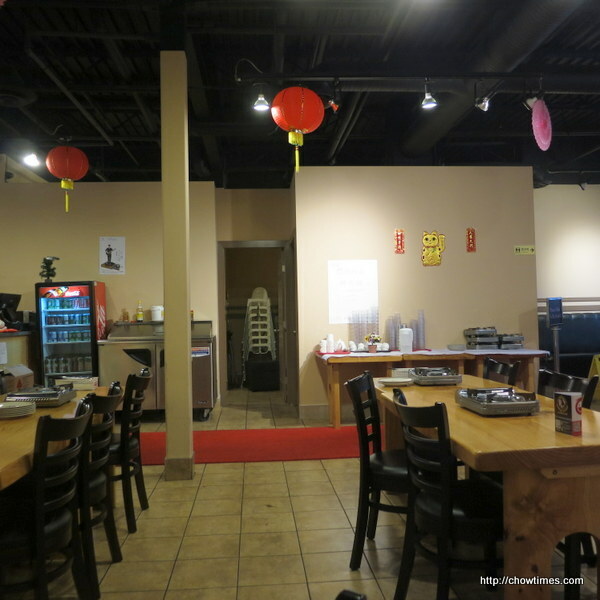 What we saw was … wow, this is not a hot pot restaurant only. As a matter of fact, they are now a HK Style Cafe AND a Hot Pot restaurant. 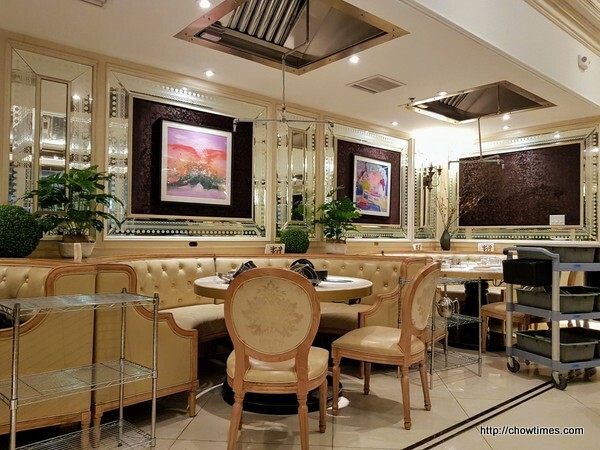 We were not aware of that transformation and so I am thinking here that there could be a number of people who are not aware of another HK Style Cafe in their midst. The restaurant is quite big. If I am not mistaken, they had expanded to take up two shop lots. It is like a two-in-one place. 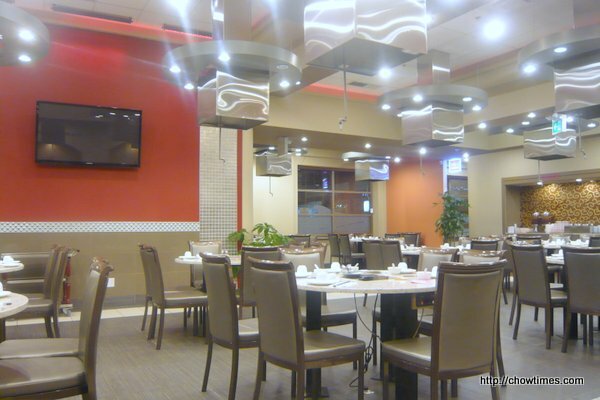 On one side is still set up as a hot pot place with built in burners and sprinkler systems. On the other side it is like what you see in a HK Style Cafe — booth tables and all. 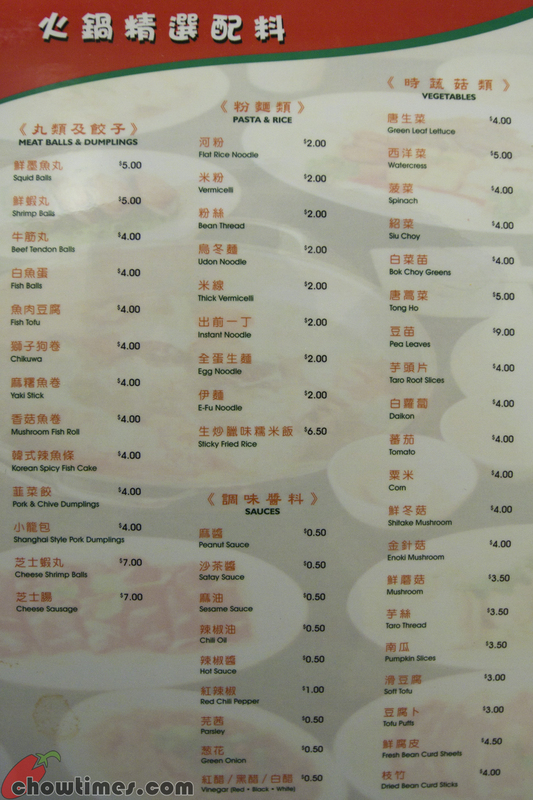 When we were there, there were more customers having hot pot than there were on the HK Style Cafe side. This is not a AYCE (all you can eat) hot pot restaurant. Click on the menu pages above and you will see what I mean. 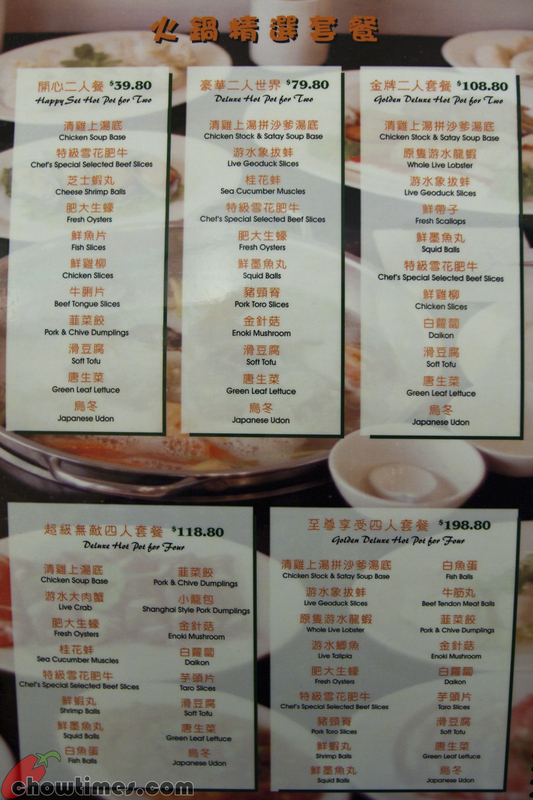 The hot pot is individual plate orders and they serve the plates in a nice gold multi-tier serving platters. 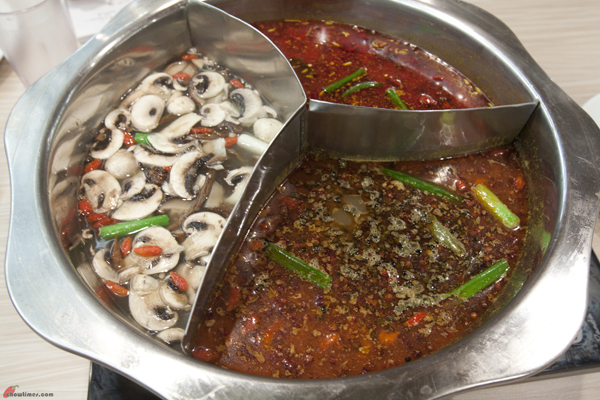 About a month ago, we experimented with having hot pot with a difference. Instead of the usual broth you normally find in hot pot restaurants, we tried it with laksa instead. And it was not just any laksa … it was with Bo’s Laksa. Many people swear that Bo’s Laksa has no equal in Vancouver. The Laksa Hot Pot was fabulous and you should try it at home. You can see our post of the Laksa Hot Pot here. 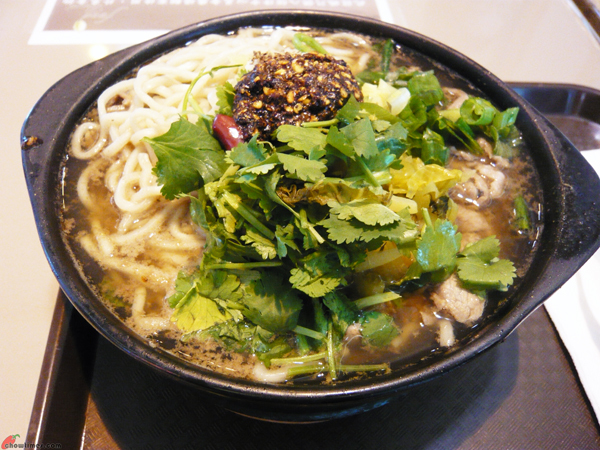 That successful trial set us thinking about other possibilities … what else besides Laksa would make a great hot pot? 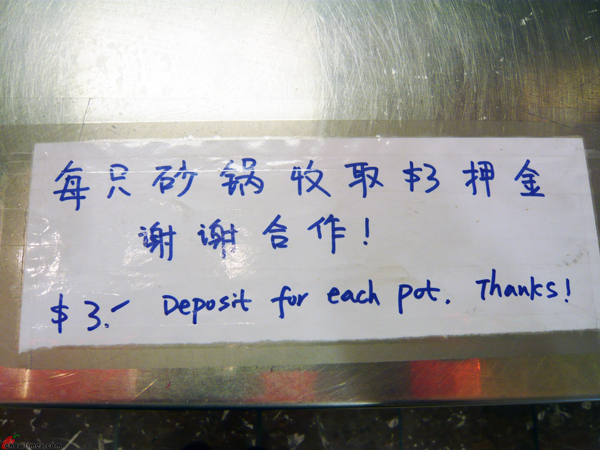 It has to be something you do not come across in hot pot restaurants. Well, we found another winner! 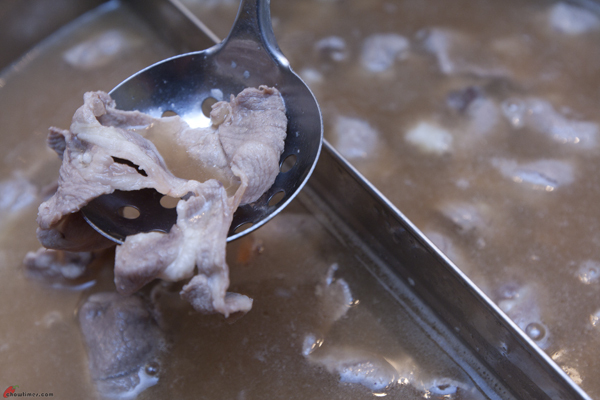 This time it is Bah Kut Teh Hot Pot. There is a problem I want to address up front. I received complain from a certain individual that sometimes I do not credit him for being the originator of the idea. I had many lunches and dinners with this individual before. So this time I want to make it right. I was reminded repeatedly by him (almost everyday!) that when I write this post, I must call out the fact that idea did not come from Ben and the idea did not come from Suanne. 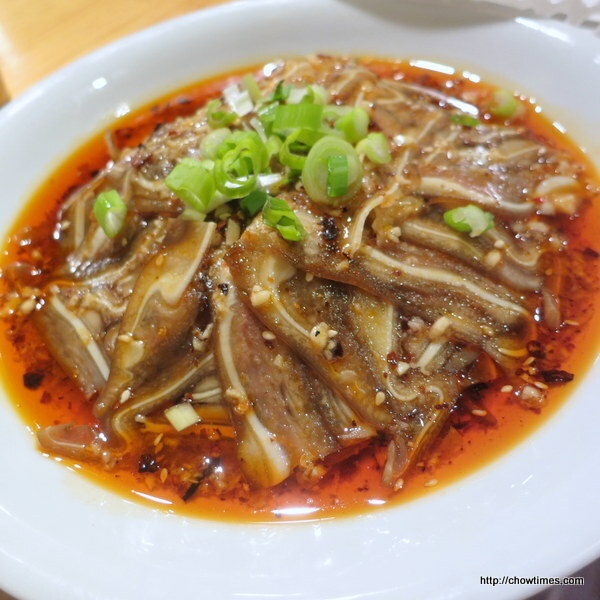 One of the customs of the Chinese New Year is the Family Reunion Dinner. This is usually held on the eve of Chinese New Year where every member of the extended family will gather at the patriarch home for a feast. When I was still living in Malaysia, the Family Reunion dinner is always something we all look forward to. We would be planning it for days and my mum will sometimes take two days to prepare for the feast. And there would be so many people that we would have makeshift tables and chairs setup all over the house. Everyone would be decked in new clothes to usher in the new year. After a very boisterous dinner, we would then go outdoor to set up fireworks and fire crackers. Yeah, fireworks is illegal but we all did not care … just as long as we don’t do it in front of the house because the police will come around looking for tell-tale signs of fireworks. Yeah, this is what Suanne and I missed every year. This is very much like the feeling of having to spend Christmas alone having instant noodle watching the burning log on TV. Well, this is something we miss having every Chinese New Year because every single one of our extended families are not in Vancouver. 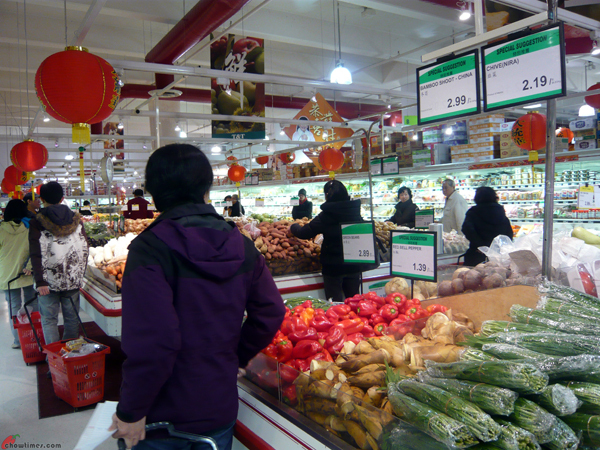 Chinese New Year in Vancouver is also a very muted affair. There is no atmosphere and the build up of excitement. I guess we will have to wait till the boys grow up, get married and have children before I can have a real Family Reunion dinner. We decided to make hot pot at home. Suanne was glad when I suggested that because it means that she does not have to think about what to cook. Anyway, I recently saw that the hot pot meat in the market in Crystal Mall was much cheaper than those we had during the last hot pot at home. Some of you may remember I blogged about it and found out that it costs about $12.00 a person making at home. I thought it was still expensive and wanted to find out how JoyLuckClub managed to do it for less than $7.00. Chinese food is generally cheap. We can often get a good full meal for just $15 and that will be better than average. 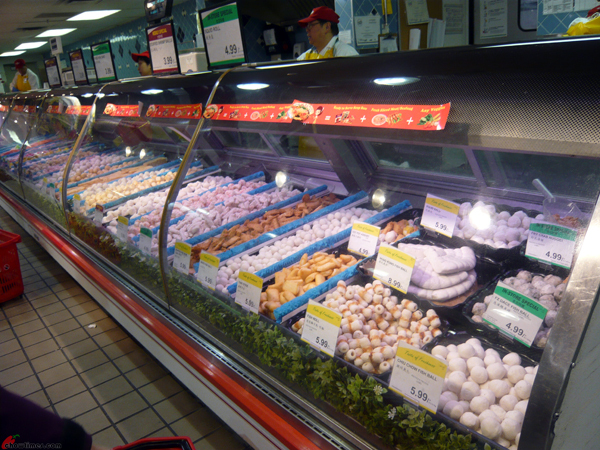 But there is one type of Chinese food that is uncharacteristically expensive. 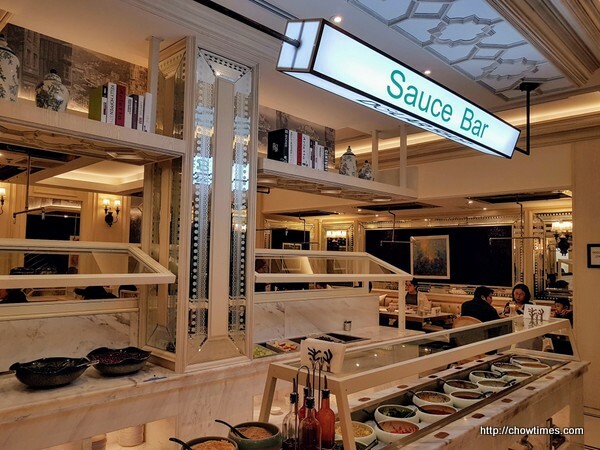 It was just last week that I blogged about a hot pot restaurant and I suddenly realized how expensive it had been eating out at hot pot restaurants. So I did a bit of math out of curiosity. I wanted to see how much it really is for one person. So I was wondering how much it would cost to make it at home … like, much cheaper compared to eating out. So that was our weekend project to get to the bottom of this question. We did not want to go scouring around town for the best and cheapest ingredients. We took the easy way out. We went to T&T and try to get everything we need in one place. We realize that some stuff in T&T are more expensive and that we don’t normally get some of the stuff we need here. Hehehe … I did not bring my big camera into the store. Instead I brought a point and shoot so that I could steal a few shots of the inside. If I get caught taking pictures in the store, I would probably get thrown out. 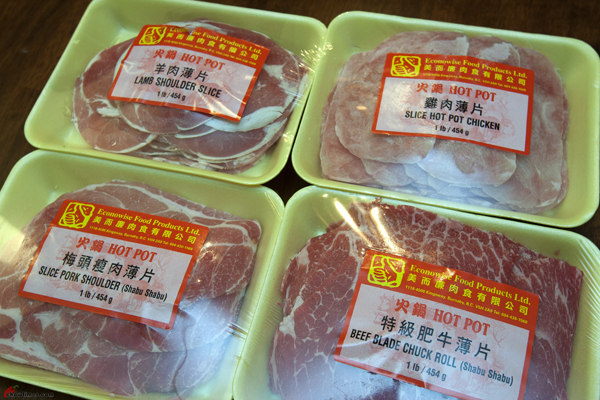 We had been having a lot of hot pots these days. Too many. I am saying that because every time we had hot pots, we ended up regretting it because most hot pots we go to are All-You-Can-Eat (AYCE) restaurants. There seems to be a lot of new hot pot places opening these days. I wonder if there is a reason to it. I do wonder if it is because it is simple to operate and at the same time they bring in more sales per customer compared to other Chinese restaurants. 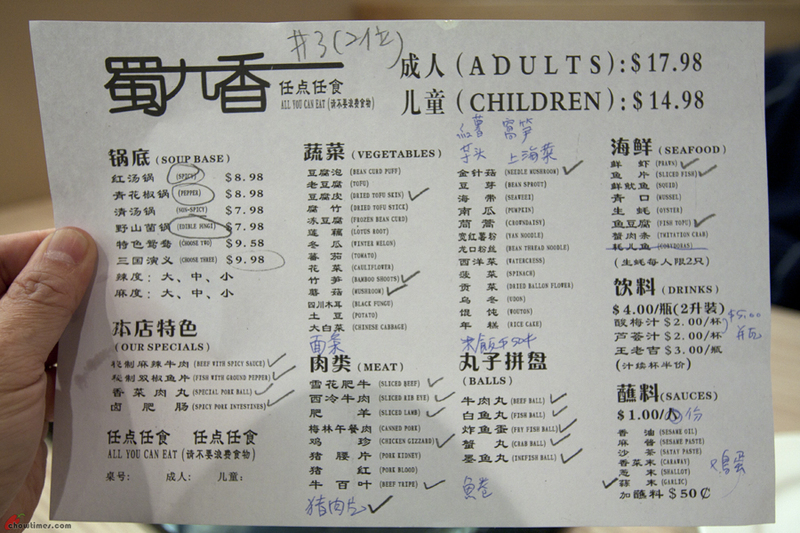 Each hot pot AYCE meal will easily cost $25-$30 per person after you factor in everything as opposed to $10-$15 elsewhere. 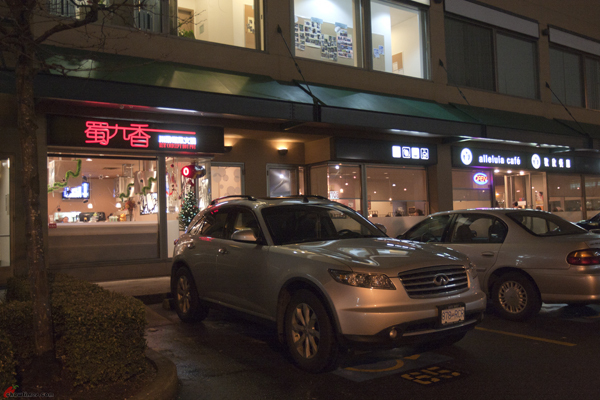 JS and TS alerted us to this new hot pot restaurant called New Concept Hot Pot a month or two ago when there were two hot pot restaurants opened at about the same time in Richmond … and right about the same neighborhood too. We ended up going to the other one – Boiling Point which serves stinky-stinky tofu hot pot. We forgot about this place after until Buddha Girl pointed out to us that this hot pot place has a THREE soup hot pot. Yup, the only motivation for us to come to New Concept Hot Pot was only because they have THREE soup hot pot. 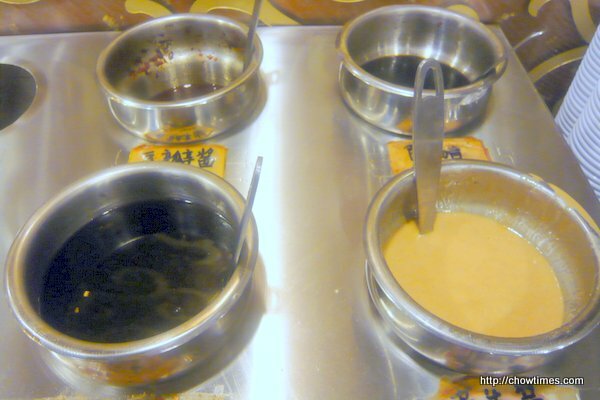 We are not aware of any hot pot restaurants in Vancouver that has three soup pots. 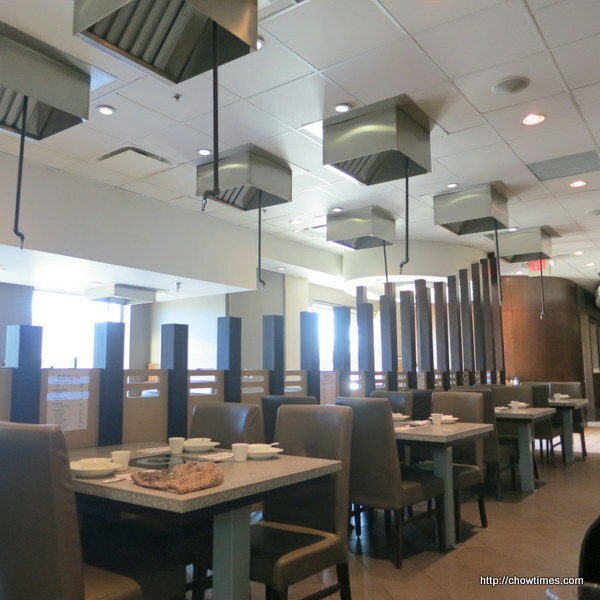 The New Concept Hot Pot is located on New Westminster Highway in Richmond. They are in the small strip mall with a double story building just east of No 3 Road. It is just next door to Alleluia Cafe. Talking about Alleluia Cafe. We had once blogged about it before (here) but it was long time ago. Five years ago as a matter of fact! We wanted to come back because it is certainly one of the better HK Style Cafes. What I wanted to come back for is their bottomless milk tea! I heard they refill milk tea. I need to prepare myself before I go because I know what bottomless milk tea does to my sleep rhythm. 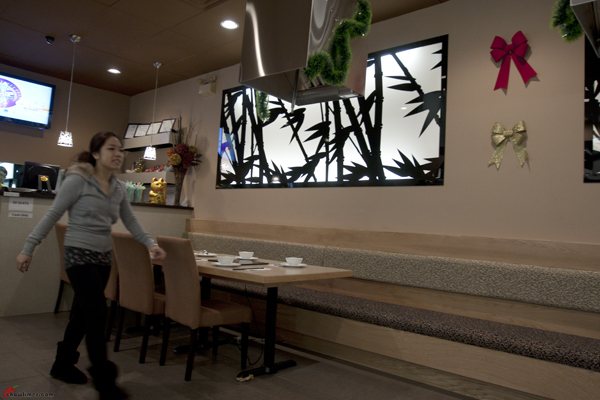 For a hot pot restaurant, New Concept is small. They only seat 20 people at one time. We went early at about 6:00 PM. No reservation is required at that time but it is chancy. By 7:00 PM, there was already a wait of 20 minutes for a table and we saw that they were turning people away shortly after. So to be on the safe side, it is best to make a reservation before hand. 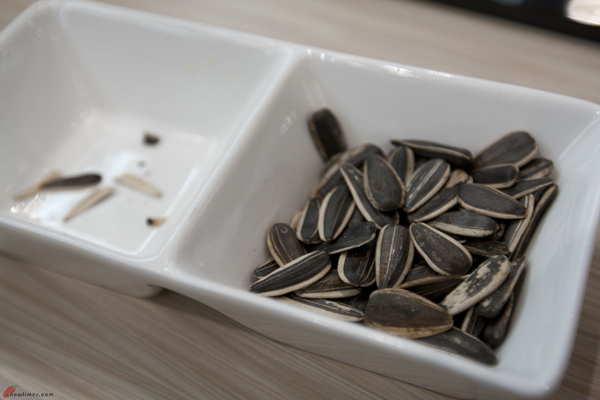 First time I saw restaurants serving sunflower seeds as a (free) snack. Do you like this? Admittedly I like it … but I will not be caught seen in public eating this. It is too feminine. Guys eat this only at home watching TV. For girls, it is cute seen eating this. Every hot pot places will advertise the AYCE price but if you add up everything, it will come up to at least $25 and close to $30. So if you don’t have a healthy money tree at your backyard, it is good to do your homework or you will feel the pinch when it comes to pay. The above is their order form. It is not big. We had seen much bigger ones. It seems like they are still expanding the menu because they hand write the new choices on it. We don’t know what these new ones are as it is all in Chinese only. We paid attention to the “Our Specials” section at the bottom left (click on image above if you want to enlarge it). There are four items on it and naturally we ticked all four. The condiments are $1 each. It’s quite OK at that price. I would be happy if it is 50 cents only. I can’t remember where now, but a recent hot pot place I went to was only 50 cents. 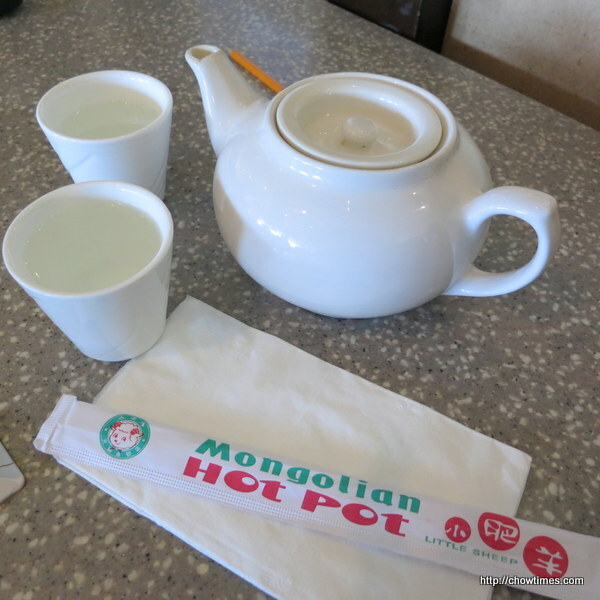 Oh wait … it is FREE in the Mongolian Hot Pot. I just like brand new tableware. 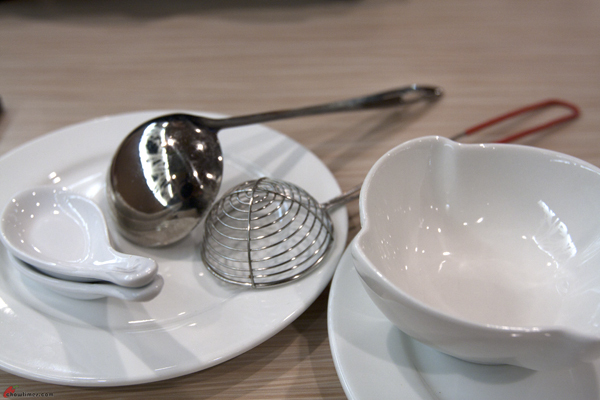 Hey question … where do you go to buy these types of tableware? They are thicker, whiter and better quality than the ones we see in Asian grocery stores. We had been using the same Corning Ware ones for umpteen years already. I think it’s time to get new ones. Here we go … to get myself physically prepared, I loosened my belt by one notch. Tada! The THREE soup hot pot.